When someone subscribes to the weekly Stonesoup email newsletter, I ask a couple of questions so I can get to know my new readers better. One of them is how they discovered my blog. Every now and then I get an email saying they were looking for soup recipes and that for a blog called StoneSOUP, there weren’t as many soups as they would expect. I take my reader feedback very seriously. So this year I’ve been on a mission to make more soup. My plan is pretty simple. Monday night has become ‘soup night’. It’s been brilliant for many reasons. Of course I’ve been making loads more soup. But it’s also made meal planning easier. Now I love Mondays! I did toy with the idea of calling this soup ‘Aussie Onion Soup’, as opposed to the French variety. 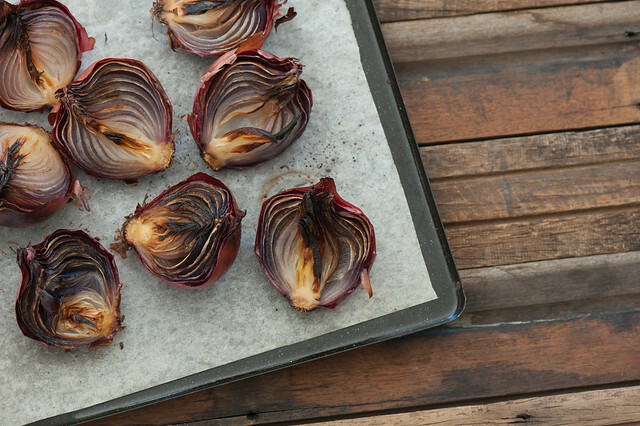 But the idea of roasting the onions first so you’re avoiding all the pain and tears involved in slicing your onions is just too brilliant (if I do say so myself) not to allude to it in the title. Beef stock is traditionally used with French onion soup but I prefer the milder flavour of a chicken stock here. Of course vegetarians are welcome to use vegetable stock. 1. Preheat your oven to 200C (400F). Cut the onions in half lengthwise. Remove any papery skins that are easy to discard but don’t worry about peeling. 2. Place onions cut side up on a roasting tray. Drizzle generously with oil and roast until well browned and soft – about 45 minutes. 3. When the onions are soft allow to cool for a few minutes before slipping them out of their skins. Slice cooked onion and place in a medium saucepan. 4. Add wine or vinegar and simmer for a few minutes before adding the stock. Bring to the boil then simmer for 5-10 minutes. 5. Taste and season generously with salt and pepper. Serve in deep bowls with parmesan grated over. different onions – use whatever onions you like. I prefer red for their sweeter flavour and because they look so pretty. short on time – peel and slice onions and cook on the stove top with lots of butter or oil on a medium heat until soft. Then proceed as per the recipe. herby – some thyme or rosemary can be lovely. hot! – serve with a good drizzle of Marco’s Chilli Oil. OR add some chopped red chilli with the stock. carb-lovers – toss in some cooked pasta, croutons or cooked beans or lentils. more traditional – melt some cheese on slices of sourdough toast and float these on top before serving. more veg – feel free to wilt in some greens jsut before serving. Fine ribbons of kale are lovely as is baby spinach. dairy-free – replace parmesan with grated brazil nuts or roast pine nuts. ps. If you need more reasons to start upping your own soup intake, you might enjoy 7 Surprising Reasons to Eat More Soup. Genius! I’m going to try this in a few weeks when I am back at home. I LOVE onion soup however the cutting and chopping and crying part leaves me annoyed so I barely make it. Great idea! Thanks. What a delicious recipe! 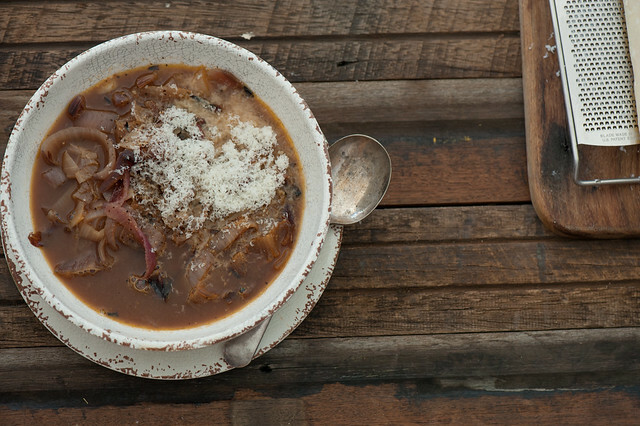 I love onion soup like this… it’s basically an umami overload, which I’m totally up for. This post reminded me of an article I just put up on RecipeLion.com – How to Store Cut Onions. The tips are pretty simple, but they’re good to know. My favorite way to store them is in a soup like this one… but if you can’t make that work, the fridge is OK too! Thanks for sharing the link to your site Kristin! Really appreciate you taking the time to comment. Don’t worry I won’t be getting all complicated, just want to allow some room to move when it’s needed. Tried it, liked it – liked it a lot! We made this soup two days ago and had it again yesterday. It was so easy, fast and tasty. We used sweet white onions cooked on the stove top, Albariño wine, fresh thyme & rosemary and Parmigiano-Reggiano. When the weather gets cooler here in New Jersey we’ll try the roasting method. Glad you enjoyed it Murray! This sounds so good and so simple. I made French Onion soup once – a very long time ago, and have never had the energy to make it again. This one I would make, even though I’m not much of a soup eater. I love the way you simplify things. I’ve been the same with French Onion Soup Susan! Oh this recipe is amazing. I made it with apple cider vinegar (oops – no white wine vinegar) and dried chilli. Had half for lunch and then the other half a few days later. Realised that I had forgotten the cheese, but no matter, I enjoyed both serves. Will definitely be making this again. Thanks Jules! So glad you liked it Nicci!